Join in the fun this weekend at Southgate's Open Day which features a variety of family friendly events while promoting fire safety messages to local residents in Southgate and the surrounding areas. The event will feature display, activities and games to greet visitors of all ages. Firefighters will dress up in different types of London Fire gear, and will be on hand to answer questions about what they do and how the equipment works. Crews will also perform a fire ladder drill and a car rescue exercise. 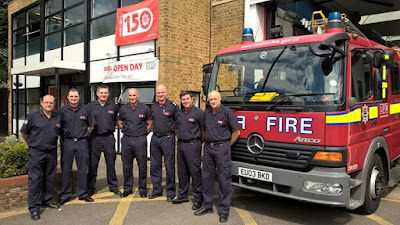 Vintage fire engines will be on display along with a local Army Reserve vehicle, and visitors will be able to look around the current appliances from the station and and operate the fire hoses. Member from the local Army and Police will speak about their activities, and the Fire Cadets will have a marching drill competition. Southgate firefighters will organise Brigade oriented games and competitions. Various local businesses will take part on the day with food stalls, and donating gifts and prizes for a raffle, including a Scott's Travel Voucher!. Children will be able to enjoy a face painting corner and a bouncy castle. St. Johns Ambulance officers will be teaching CPR, and the Transport for London and Enfield Road Safety team will be teaching road safety to children.